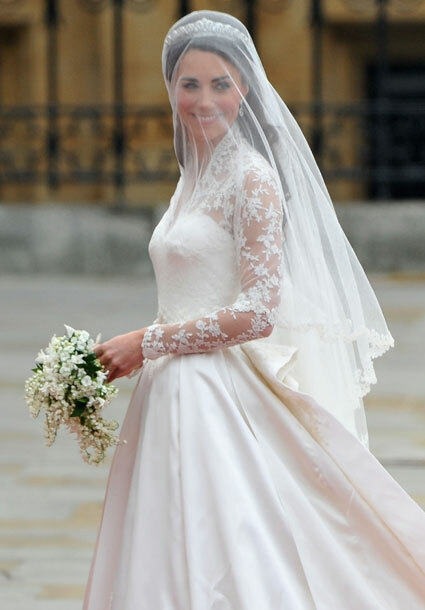 There is no doubt about it, Kate Middleton was absolutely stunning on her big day. Decked out in Alexander McQueen, the Duchess's style was regal, understated, elegant, modern, and classic at the same time. This dress is reminiscent of Grace Kelly's wedding gown (which is our favorite royal bridal style) and the timeless look will keep it from looking dated in the history books. It's interesting to note how the v-neck is Kate's signature look, and the neck and bodice of this dress reminded us of the blue dress she wore to announce their engagement. Well done, Duchess! The best part about marrying the heir to the throne is that you can wear two dresses and no one thinks you're extravagant. 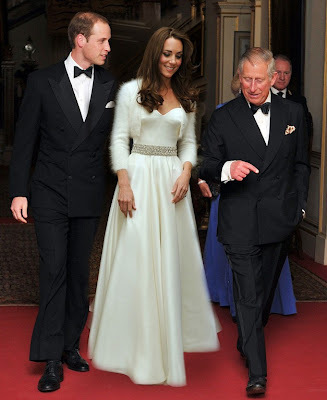 Kate opted to wear Sarah Burton for Alexander McQueen again, and again she looked gorgeous. This dress was definitely more modern than her ceremony gown, but still lovely and elegant. We can't believe how tiny her waist looks, and as cute as the mohair shrug is, we can't help wondering if it got all over Prince William's perfect black tux. It looks like Kate's little sister, Pippa, is officially England's new darling. While we don't quite agree that she stole the show from Kate (I mean really, you can't ignore the tiara and veil), we do think she was one of the most chic bridesmaids in the history of all weddings. Also wearing Sarah Burton for Alexander McQueen, Pippa's simple, ivory colored dress with the cowl neck turned a lot of heads, including Prince Harry's we hear. We also loved the green dress she changed into for the reception, but she was just perfect at the ceremony. 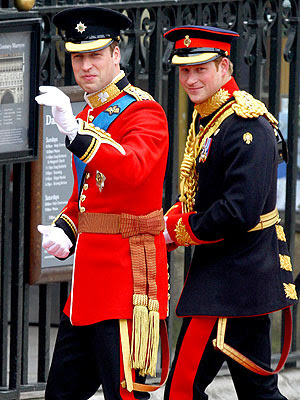 Something about seeing the two princes together in their military outfits made us all teary eyed. Maybe its because we've grown up with them, or maybe it was all the commentary about their mother, but those two boys (or young men, we should say) really know how to tug at our heart strings! It's really very touching how well they seem to get along, and together they represent a young, healthy, and strong royal family. Aside from the newlyweds, David and Victoria Beckham were definitely the best dressed couple. Apparently Becks wore his medal on the wrong side and never actually put on his top hat, but he looked so dapper it really doesn't matter. As for Victoria, surprisingly enough she had one of the more sensible hats of the day, which is saying a lot (althoughwe aren't quite sure how it is sticking to her head..)! While we wished she smiled more, we loved her custom made Victoria Beckham dress, which framed her baby bump nicely. 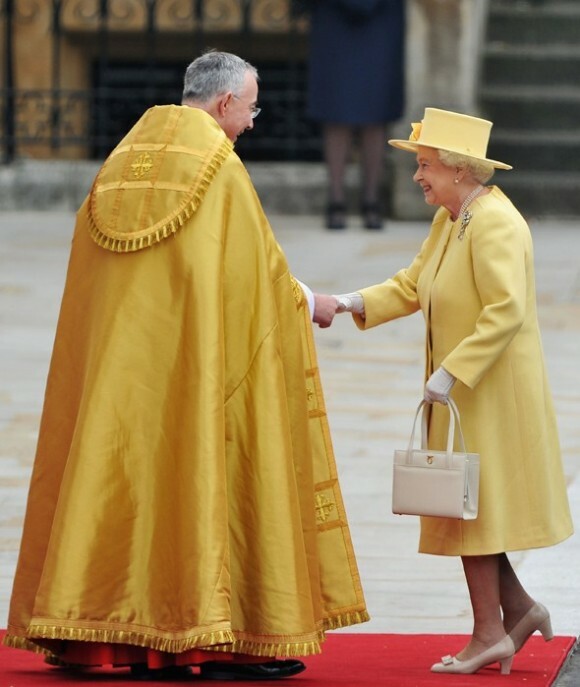 Last, but not least, is the Her Majesty, Queen Elizabeth herself. She was absolutely a ray of sunshine today, all decked out in yellow, and she really seemed to be enjoying herself. We wonder every time the crowd sings "God Save the Queen" if she feels secretly awkward, or really enjoys having everyone sing to her while she politely pretends to listen. We think it's the former.